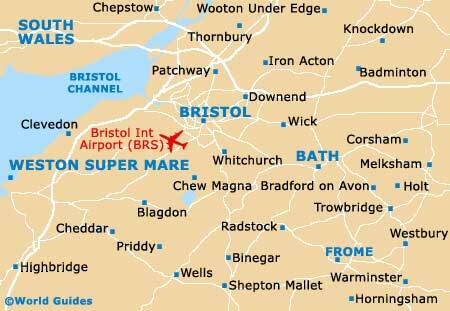 Bath really is a very charming and welcoming city in all aspects, and most tourist attractions reside within the very city centre, where they are within easy walking distance of each other. The Jane Austen Centre on Gay Street is one attraction well worth searching out and stands just across from Queen Square, a small parkland where local office workers regularly come to eat their lunchtime sandwiches, or to play a game of 'boules'. After an afternoon spent shopping at the gleaming new Southgate shopping centre, why not relax in the rooftop pool at the Thermae Bath Spa, take a stroll along Great Pulteney Street, or enjoy a bite to eat at Sally Lunn's House. Tourists looking for evening attractions and entertainment should consider taking in a show at the Bath Theatre Royal, or maybe even joining a memorable ghost walking tour around the city centre. Open-top hop on / off Bath guided bus tours operate throughout the day at regular intervals in the city centre. These tours provide an easy way of sightseeing and with daily hop on / off tickets, they are also a very useful way to travel around, since you can leave the bus to explore and get back on when you are ready. The sightseeing bus tours connect all of the major points of interest in the city, including numerous tourist attractions, landmarks and even the university campus. These buses are operated by several different companies, including Guide Friday. There are a number of walking tours around Bath and these provide tourists with a real insight into some of the city's most interesting and historic attractions, landmarks and Georgian Streets. Tours are available with the Mayor's Corps of Honorary Guides, and the tour guides are usually locals who live in the city. This particular tour is free and leaves from the Pump Room daily at 10:30 and 15:00. Walking tours should usually be booked in advance to ensure your place. There are a number of walking tours around Bath and these provide tourists with a real insight into some of the most interesting and historic attractions, landmarks and Georgian Streets. Tours are available with the Mayor's Corps of Honorary Guides, and the tour guides are usually locals who live in the city itself. Tours leave the Pump Room daily at 10:30 and Sunday to Friday at 14:00. Book well in advance for parties of 12 or more people. For smaller parties there is no need to book, just turn up in the Abbey Churchyard. Perhaps the most unusual and popular walking tours available are the Ghost Walking Tours, which provide a fascinating way to learn about some of the more unusual aspects of this city and its numerous reputed ghosts. 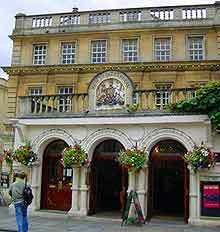 The tour lasts around one hour and departs from the Garricks Head pub daily at 08:00, close to Bath Abbey. Booking in advance is not necessary for the Ghost Walking Tours, although it is advisable to confirm times. 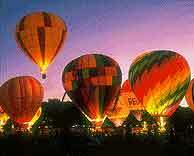 Champagne Balloon Flights are available from Bath's Royal Victoria Park throughout the summer on fine days. The balloons mainly take off early in the morning and again in the evening, and provide one of the most spectacular ways to view the streets below. Of particular interest in the Royal Crescent and the Circus, which can only really be fully appreciated from the air. Balloon flights need to be booked in advance and most local balloon pilots provide champagne and souvenir photographs as part of a package deal. The Bath Boating Station is situated at the far end of Forester Road, close to the city centre, and boating is a popular activity for tourists and visitors during the summer months. Wooden boats, canoes and punts can be hired at the Boating Station, all of which are made on-site, and some boats are almost 100 years old. Attractions include refreshments, the scenic riverside and the Victorian boathouse. Bath Theatre Royal was originally built on this site in 1805, and was rebuilt in 1862, after being badly damaged by a fire. This theatre boasts a range of shows and productions throughout the year, including many productions from London's West End, and is a popular attraction for both tourists and locals in the area. The Theatre Royal is also used as a venue for a number of concerts, comedy events and contemporary plays. Other attractions at the theatre include a restaurant, a bar, and there are also reputedly several ghosts that live in the theatre. Situated right in the heart of Bath, the Jane Austen Centre is one of the most famous tourist attractions in the city and Jane Austen has become synonymous with Bath. Jane Austen lived here for a number of years at the end of the 18th century and soon became one of the city's most well-known and highly regarded residents. Set in a grand Georgian Town House, the Jane Austen Centre celebrates her life and the importance of her varied achievements, which influenced many of her world-famous novels, including Pride and Prejudice, Sense and Sensibility, and Emma. Attractions include displays about the many television and video adaptations of Jane Austen's novels, elegant Regency men's, women's and children's day and evening wear, unique photographic enlargements of rare contemporary prints of Bath around 200 years ago, and helpful guides. 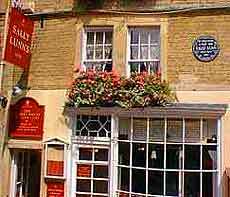 This large tourist attraction is located in Walcot Street, in the heart of Bath's artisan quarter. Attractions include demonstrations of the ancient craft of free blown and stained glass making, illustrated talks, displays of ceramics and pottery, children's hands-on activities, and a large gift shop selling stylish glass, mirrors and jewellery. The elegant and charming Pump Room is one of the most popular tourist attractions in central Bath and has been attracting visitors since being established in 1795. Morning coffee, afternoon tea, lunch and Bath buns are all served here, accompanied by classical music played by the Pump Room Trio or resident pianist. Attractions at the Pump Room include two sedan chairs, which were the equivalent of taxis in the 18th century, views of the 'Great Bath' and Thomas Tompion's long-case clock. Sally Lunn's House is believed to be the oldest house in the entire city and this is where the famous Sally Lunn started to sell her legendary brioche-type buns in the 1680s. Now known as the 'Bath bun', other highlights for visiting tourists include Sally Lunn's popular restaurant serving sweet and savoury meals, and an interesting museum in the basement, where excavations have revealed occupation as far back as the Roman times. The city's Sports and Leisure Centre has many attractions for tourists visiting this city. These attractions include a large swimming pool, a smaller pool for children, squash courts, tennis courts, badminton courts, a fitness centre and gymnasium, aerobics and dance classes. The Sports and Leisure Centre is run by Bath and North-East Somerset Council and is situated next to the Recreation Ground. Recently constructed with a multi-million pound grant from the Millenium Commission, the Thermae Bath Spa is one of the city's latest tourist attractions and allows people to immerse themselves in the natural hot springs of the city for the first time in 25 years. One of the main attractions at the Thermae Bath Spa is an open-air rooftop pool, which offers a spectacular view of the cityscape and the surrounding hills. Other attractions include bathing pools, whirlpool baths, steam rooms and natural water supplies. 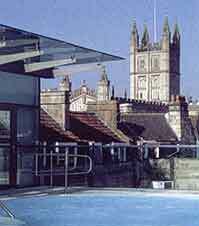 The Thermae Bath Spa is the only place in Britain where you are able to bathe in natural thermal waters. The highly-acclaimed building features a dramatic use of glass and stone. Bath's Great Pulteney Street ranks amongst the city's most grand streets, lined with many elegant, six-storey houses constructed of Bath stone. Attractions include nearby Laura Place, a large and impressive fountain close to Pulteney Bridge, and the Holburne Museum of Art. Also nearby are a number of parks, including Sydney Gardens and Henrietta Park. The recently restored Kennet and Avon Canal is around 160 km / 100 miles long and runs from the Severn Estuary near Bristol to the River Thames at Reading. Once the main way of transporting commercial goods in Bath, the Kennet and Avon Canal has now become one of the most scenic tourist attractions in Bath. There are trails on the canals' previous towpaths next to the beautiful countryside, bicycle hire, narrowboat trips and car parking areas. It is also possible to hire boats at several places along the canal, particularly at the Limpley Stoke centre, on the outskirts. Built in 1810, part of the Kennet and Avon Canal heads towards Devizes, where there are a staggering 29 locks to negotiate, which enable the Kennet and Avon Canal to climb 229 feet / 70 metres in just 3 km / 2 miles.